A thick, well built safety who looks the part, has a natural bubble and muscular upper body. Is very effective playing downhill inside the box and consistently gets early jumps on the ball, reads and reacts quickly and exhibits “plus” instincts as a run defender. Is routinely able to read the action quickly, close on the football and is a solid wrap-up tackler. Generates good power into contact working in pursuit, and once he gets his stride going, exhibits solid range off his frame and despite being a bit tight, he breaks down well on contact, using his strong upper body to wrap and runs his legs through contact. He understands angles, runs the alley well and routinely is able to wrap, even in the open field. Those same instincts show up well in the pass game, as he’s a bit of a ball hawk who has the ability to routinely get early jumps on the football. Exhibits impressive instincts, which routinely allows him to get early jumps on the football and put himself around the play. Looks a bit tight in his drop, causing him to get upright and he will get elongated/overextended with his footwork when looking to click and close, losing a bit out of his breaks. However, he’s consistently moving toward the action before any defender and, once he collects himself, has a better closing burst than given credit for. Lacks great straight-line speed, but looks like a 4.55 guy who plays faster because of instincts. Exhibits good ball skills, taking proper angles toward the throw, and can adjust and make a play. Will play over the slot at times and does a nice job feeling routes develop around him, squatting on throws, keeping his feet under him, his base down and is much cleaner out of his breaks. Nevertheless, he lacks a great initial first step and looks tighter when asked to turn and run. He gets upright, struggles to get back up to speed quickly and lacks the type of second gear to make up for a false step. Impression: Isn’t a guy you want to trust to run with receivers down the field. However, because of his solid natural range and instincts, I can see him getting over the top and making plays in a center field type role as an NFL strong safety. A little stiff in coverage, a Strong Safety only in the N.F.L…Doesn’t have blazing speed…doesn’t make a ton of plays on the football in the air, more takes advantage of mistake passes..Doesn’t have great recovery speed..
There’s a lot to like about Harrison Smith, who is just a very smart football player. He’s not without athletic ability, because he clearly has that and he also has good size, but the strength of the game is how fundamentally sound he is in all aspects of his game. He is as good of an open field-wrap up tackler as there is, he doesn’t get fooled often by play action or misdirection plays, and he doesn’t try to make a highlight reel interception in the wrong situation. He looks a little stiff in coverage and gets more of his interceptions on bad quarterback passes then he does on making plays on the football (last year three of his 7 interceptions came against Miami, this year five of his 9 pass deflections have come against Michigan State), but he’s not going to cost a team touchdowns either. He just does everything pretty well and everything right. Strengths: Ideal size for a Safety prospect – Smart, savvy and instinctual football player – Takes very good angles to the ball – Not fooled often, trust his eyes – Likes to come up and assist in run support and can play physical, but at the same time seems natural playing “centerfield” – Reads the QB very well and gets a great jump on pass routes – Not often in the wrong position – Solid fundamental tackler – Good ball skills, breaks up a lot of passes – Incredibly consistent production – Has the ability to play both safety spots – Smith is just an overall fundametally and instinctually sound player – Very coachable – Team Captain and exhibits a very solid work ethic. Weaknesses: Not as fast or athletic as other DBs – Will not be able to turn and run with faster WR – Takes him longer to get going, relies heavily on his instincts – What safety position does he play in the pros? 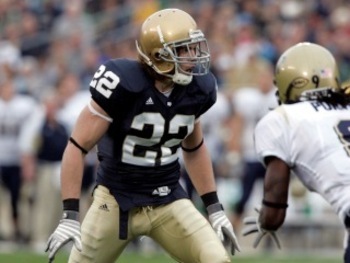 Harrison Smith is an intriguing safety prospect. Technically sound. Smart. Good size. Productive. Can play the run and the pass. Not the fastest guy in the world, and that will hurt him. Versatile. When looking at safeties for the Giants, you have to think: Can he do what Deon Grant does? In other words, can he act as a third linebacker? Is he better playing downhill than turning and running? Can he be strong in run, strong in pursuit, and make tackles? Well Smith can do that. His speed will hurt him when he runs with the faster tight ends. But he can cover most and can play in the box. My big fear is teams will try to isolate him on a back or a speedy tight end. If that happens, Smith will lose. But, he has a lot of other things to like, and he’s really instinctive. He can make plays on the ball and as that psuedo-linebacker, he can excel.